Volkswagen’s director Alex Smith speaks to Business Vans about their donation of their new and first German built Amarok vehicle in the UK. New article released from Business Vans. ANIMAL welfare charity the RSPCA is set to benefit from the donation by Volkswagen of the first right-hand drive Amarok pick-up to come off the line since production began in Hanover. The RSPCA will be using the latest Amarok pick-up, which is equipped with a 2.0 BiTDI engine producing 180hp and an eight-speed automatic gearbox that’s new to this model. In addition, to improve fuel economy and emissions, it is fitted with Volkswagen’s BlueMotion Technology, which is now available across the Amarok range. The 180hp BlueMotion Technology model with automatic transmission and 4MOTION permanent all-wheel drive offers combined fuel consumption of 35.3 mpg. The Amarok will be delivered to the RSPCA in the UK after the fitting of accessories including a hardtop and protective seat covers. It will then go to work at one of the charity's biggest and busiest facilities, the Southridge Animal Centre, handling rescued animals ranging from domestic pets to pigs, goats and horses. The Amarok's 4MOTION all-wheel drive and pulling power will be valuable when retrieving animals from off-road locations, and for towing equipment around the 16-acre Southridge site. Alex Smith, director of Volkswagen Commercial Vehicles in the UK, told Business Vans: “At a time when incomes for charities are under pressure, we are delighted to support the RSPCA with the perfect off-road vehicle with plenty of traction, load capacity and towing power. 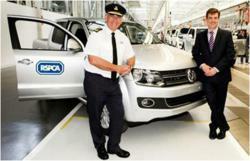 “The RSPCA is often seen as another of the emergency services, and I know the Amarok will be working hard,” he said. Volkswagen Commercial Vehicles officially presented the Amarok to the RSPCA at a special event in Hanover, which was followed by a tour of the factory. Kevin Degenhard, chief inspectorate officer of the RSPCA, who accepted Volkswagen's invitation to the event in Hanover, said: “The Amarok is a very impressive vehicle and we are privileged and proud to have the first one from the European production line. “Our staff are looking forward to the Amarok joining our business van fleet, and I assure you it will be put to very good use and tested to extremes,” he said. Keep up to date with developments in our Business Van News section. Business Vans offers a wealth of useful information including tacographs, van MOTs and a range of reviews including Hyundai van reviews.